This scenario is probably the most complicated one I’m working on. It was supposed to just be the “carrier ops” scenario, but in designing it to be realistic(-ish), it also became the “including orbits in your game” scenario. The set-up: the tension within China between the Communist rulers and their Capitalist economy finally boiled over into a full-blown civil war, and the miners at Xìngyùn sided with the Capitalists.The Communists won the war Earth-side, and sent the Beijing to retake their colony. This takes place about 10 years before the Battle of Ascension, before the design of the propellant-less drives that allow the sustained thrust that characterize Starships. In contrast to the station’s circular-enough orbit, Beijing has to switch between three orbits: the first is a hyperbolic orbit around Luyten 726-8 as it drops out of warp and enters the system. The second is an elliptic transfer orbit from the hyperbolic entry orbit to Xìngyùn’s. The third orbit is around Xìngyùn itself. The scenario therefore needs to model three orbits: Beijing’s original entry orbit, the transfer orbit, and Xìngyùn’s orbit. The Communist player’s objective is to neutralize the Capitalist player’s fighters and enter orbit around Xìngyùn. The Beijing has only enough fuel for three burns in the system — if the Capitalist fighters are not neutralized, that third burn is used to return to Earth. Scale: a turn is 3 days long. Roles: the Communists are the attackers, and the Capitalists the defenders. Objectives: this is a simplified fleet engagement. Each fighter destroyed is worth 1 point, and each hull point destroyed on Beijing and the station are worth 5 points. Postures: Beijing is in a hyperbolic orbit, and Xìngyùn Station is in a circular orbit. See Orbits, below, for details. Locations: Luyten 726-8 is a red dwarf. Treat it like a gas giant with a seven-inch diameter, but use the gravity table defined below. Momentum: the Communists start the game with Momentum. Game Length: unlike normal games, this scenario ends after turn eight. At this point, Beijing will enter orbit around Xìngyùn and begin disgorging ground troops. Delta is the distance between the attacker’s inertia marker and the defenders, rounded up. When fighters attack, roll against the target’s delta, and ignore armor. Ships targeting fighters also roll against delta. In this scenario, there is no such thing as a dogfight. Instead, the opponents make a single attack as they fly by their enemies, like knights in a joust. The order of attack depends on whether the confrontation is between strike groups, or involves patrol groups. If a patrol group is intercepting a strike group, resolve its attacks first. Otherwise, resolve the moving strike group first. The group with fewer fighters determines the size of the combat. 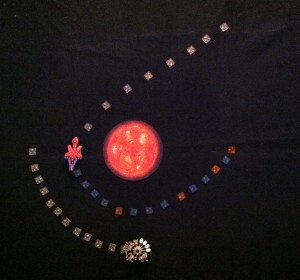 The first player rolls that number of dice against the target’s delta. Any hits are actual casualties. The second player rolls one die for each survivor, targeting their opponent’s delta. All survivors of the combat remain on the table, but they’ve expended their ammunition and cannot attack again until they’ve returned to their carrier. Separate armed fighters from unarmed fighters. This is the only time a ship might be accompanied by two patrol groups: one with ammunition, and one without. It the ship they’re escorting is not a carrier, a patrol group converts to a strike group without ammunition to maneuver to a carrier. The group inherits the escorted ship’s inertia that phase. Example: a Communist strike group of four fighters would move through a Capitalist strike group of six fighters. As both are strike groups and the Communist group is moving, it attacks first. The Communist player rolls four dice (as the smaller group has four fighters) and rolls against the delta of 11. The results are 3,5,6, and 10 — one hit, because natural 10s always hit. The Capitalist player returns fire with three fighters (four were originally involved in the joust, minus the one that was destroyed). The results are a 1 and two 10s! The Communist player loses two fighters. The Communist marks his strike group’s reduced state, and expended ammunition. The Capitalist player adds another strike group to the table. The original contains the two fighters that did not joust (and which are still armed), while the new one contains three fighters with expended ammunition. A fighter that has expended its ammunition is not automatically recovered. The fighter must fly back to its ship in real time, unable to attack another enemy. A friendly carrier may attempt to recover all fighters touching its base at the end of a movement phase, up to its current fighter rating. Ignore bingo fuel for this scenario. Ignore the empty magazines rule for this scenario. Cruiser. Hull 16, Shields 0, PD 2, Armor 7, Thrust 0, Overthrust *, 24 Fighters. 240 points. Cruiser. Hull 16, Shields 0, PD 3, Armor 7, Thrust 0, Overthrust 0, 18 Fighters. 252 points. Both Beijing and Xìngyùn Station travel predetermined routes this scenario. Xìngyùn Station is in a circular orbit about Luyten 726-8. Xìngyùn Station starts 8 inches from the red dwarf, on a center line opposite Beijing. Xingyun Station and Beijing square off. The orange markers are the station’s location at the end of each Movement Phase, which are roughly 4 inches apart. On turn 4, the station should be 90 degrees along the orbit. 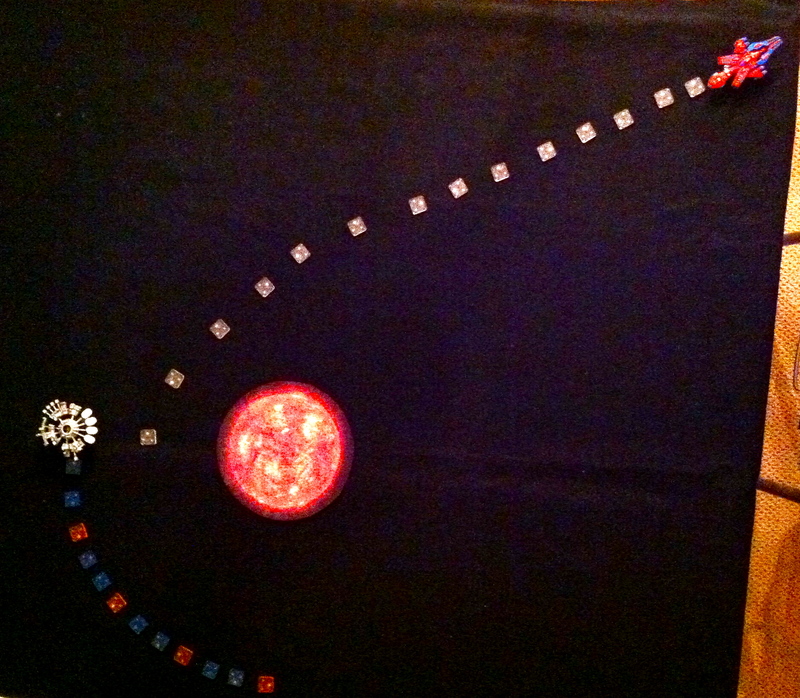 The station continues on the same path for the next four turns, and ends the game opposite its starting location. Beijing starts on a hyperbolic orbit. Place it in the corner of the area of operations, 27 inches from Luyten 726-8. It will travel along this route during the first four turns, until it ends one the same line that the station started, only in a lower orbit (3 inches instead of 8). On turn five, it executes a burn (count it as overthrusting) and moves along a new orbit, an elliptical transfer orbit that will intersect the station’s on turn 8. Beijing and a transfer orbit. Communist General Hu was limited in his response. His aerospace fighters were designed to operate from planetary orbit, and the Moultrie-built patrol cutters out-ranged them significantly. Hu rotated his fighters as a defensive screen while Beijing plodded towards Xìngyùn. The Capitalist pilots, on the other hand, had not properly considered tactics before the Communists had attacked, and the Xìngyùn pilots jousted overmuch. Beijing made it to Xìngyùn with only the barest of scratches, but its fighter force was out of ammunition, and useless for the campaign ahead. This is probably the most “beta” of the scenarios I’ve got in the pipeline. The orbital approach adds a level of complexity that might detract from the fighter ops. The alternative that I considered would have had two Beijing-class carriers face off from opposite sides of a gas giant. 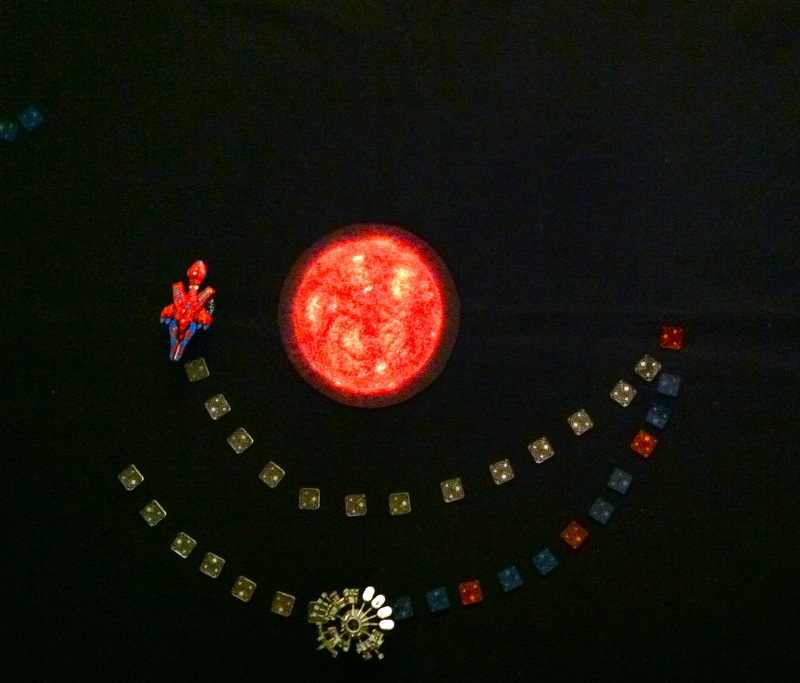 The symmetrical nature of that scenario could have reduced the whole exercise to dice-rolling. 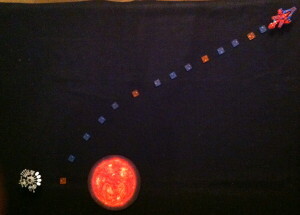 Once I decided to add orbits, I gave up on a fixed scale. While I haven’t done the math, my gut told me that the orbits would not have lined up so cleanly as I represented them. I didn’t want you to have to play with protractors (at least, not yet — that’s scenario five). 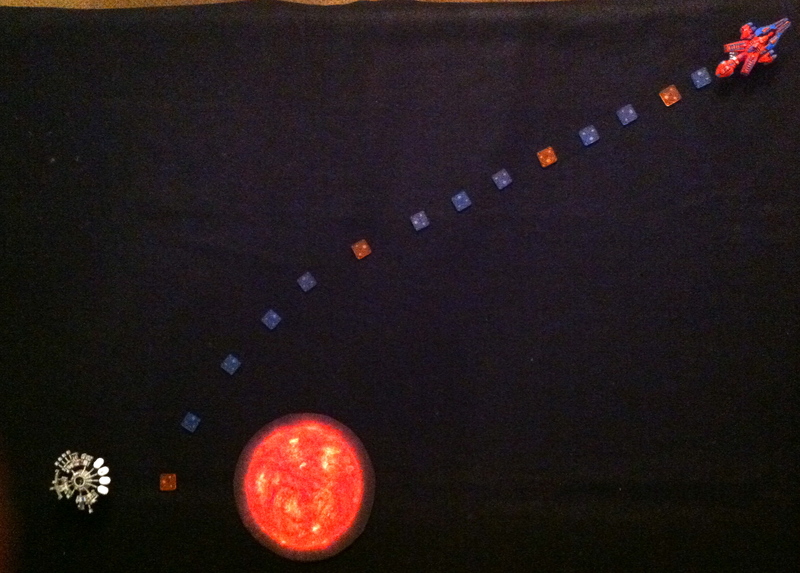 Instead, I’ve just given a general time scale, based on the period of an orbit in the habitable zone of a red dwarf. In theory, Beijing’s flight could happen the way I’ve presented it, since Xìngyùn’s contribution to the launch window occurs every month or so — but Beijing would have to hit Xìngyùn’s sphere of influence after traveling light years from Earth. A daunting prospect, to be sure. As for the jousting rules, the doctrine I chose to adopt matches the usual outcome of the basic rules: that the fighters break off, and return to their carrier. A more rational doctrine dictates that strike groups ignore each other unless their course and speed matched. Feel free to try the scenario that way, as well.